A friend of mine, who is a great baker, sent me this recipe that she adapted from a clipping that she cut out of the Chicago Tribune in 1994. She's getting ready to move and discovered it when cleaning out her files. She had kept it for 15 years but never tried it (just how many of us have recipes lying around for decades that we've never tried?) 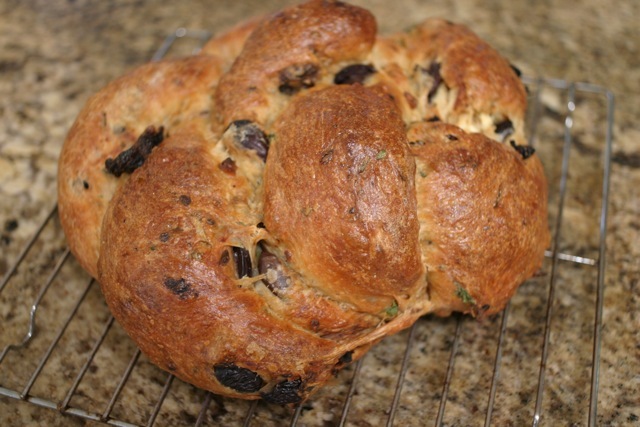 The recipe from the clipping was from The Bread Book by Betsy Oppenneer. 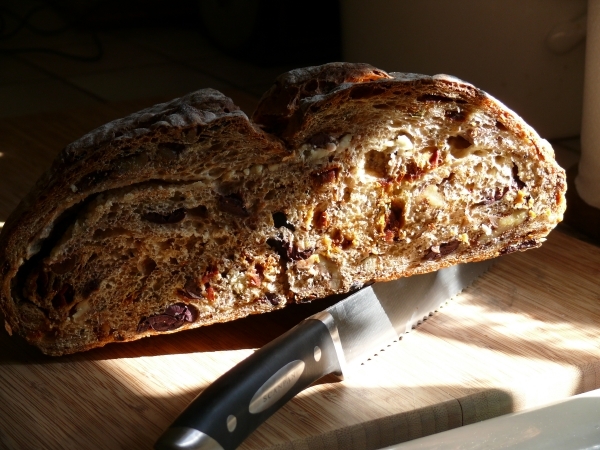 I just made half of the recipe but I was really sorry that I didn't make the full batch because this is such a delicious bread with a lot of interesting flavors, a nice soft crust, and a powerful aroma that was even present upon opening the loaf up the next morning. It made my whole kitchen smell like a bakery. Combine water, yeast, flour, dry milk, sugar, egg, and salt in mixer bowl. Mix with paddle just to combine. Add in tomatoes, olives and parsley at the end being careful not to break them up too much. Let dough rest 15 minutes in covered mixer bowl. Turn out onto lightly floured counter and knead a few turn to form a ball. Place in oiled covered container and let rest another 15 minutes. Do a stretch and fold. Return dough to bowl. Wait another 15 minutes and do a 2nd stretch and fold. Return to covered bowl and let rise until double (about an 1 1/2 hours--I can't remember exactly how long this took). Divide dough into two equally sized balls and roll each out into a cylinder about 12" long and 1/4" thick. Sprinkle each rectangle with half the feta, and then cut the rectangle in half length-wise. Roll up each strip of dough tightly to form a long cylinder, and then roll each cylinder back and forth until each is 24" long. Braid two cylinders together and then coil them to form a round loaf. Place each loaf on parchment, spray lightly with pan-spray, cover loosely with plastic wrap, and let proof until almost double, about one hour. Place oven stone on rack in middle position and preheat oven to 375º F.
Just before baking, brush loaves with egg wash. Bake directly on stone for about 35 minutes until center reaches 190º F.
Makes two round loaves (can also be baked in loaf pans). It also makes great toast. I had it for breakfast and lunch! Now that looks scrumptious! I bet it would go great with a slice of cherry pie for dessert! Great photos! Is the pie cool yet! Cooled, ete, and 1/2 given to my neighbor who also uses Crisco in her pies shells. But there are still two slices left so we'll be fine unless we die from transfat tonight which is unlikely since Jim's mother is still kicking at 90 years of age. Thank you for posting this -- I am definitely going to try this recipe this week -- it sounds like a perfect blend of flavours. I'll let you know how it works out. Thanks, Karen. It really is a delicious bread. I hope you enjoy it as much as I did. 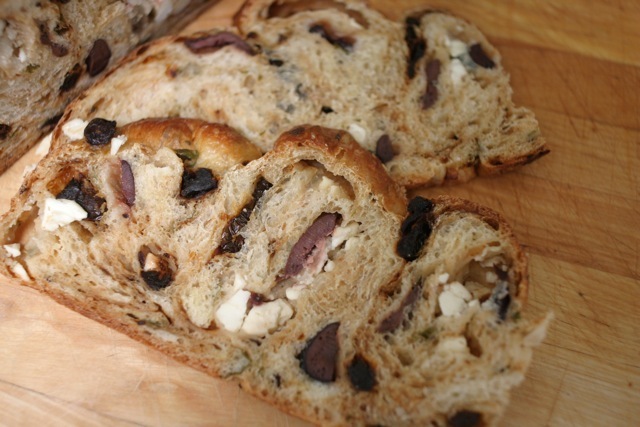 Did you wash the Kalamata olives before you put it in the dough? I just dumped the olives out of the jar into a strainer and patted them dry. The amount of salt is minimal in this recipe. I assume this is because of the amount of salt contained in the olives and cheese. I'm not a vegetarian, but it would make a complete meal with a salad. 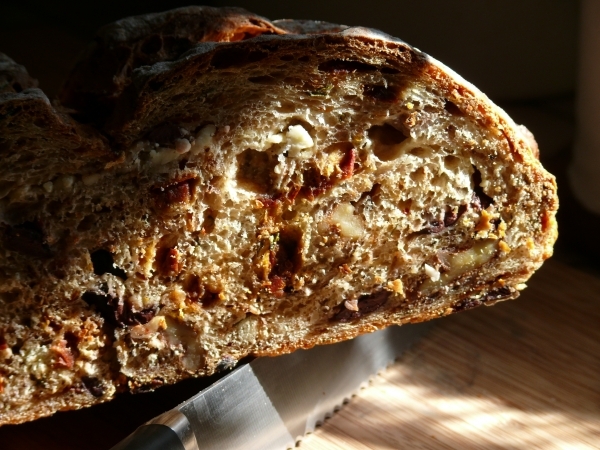 and this loaf looks AWESOME, and I can't wait to try it! I love the braided look to it too! Thanks for sharing...esp since feta is my favorite cheese! if it's as good as it looks, i gotta give it a try, Pamela. Thanks. I've made it twice now and think it is a winner. What a a tasty looking loaf that is! Thanks for sharing..this is on the to do list! Thanks, Betty. I'm sure you will enjoy this easy-to-make loaf. Great looking bread! I can't wait to make it. How did you shape it? After you roll it out into two rectangles and sprinkle the dough with feta, you cut each rectangle in half, length-wise. Next, you roll up each of the four strips as tightly as you can from the long side. Then, elongate each of your rolls until they are about 24 inches long. Form an "X" with two of the rolls, braid them together, and coil into a round. They were very specific! I can't wait to try this bread. gets me in trouble every time. One of my greatest faults is that I skim when I read. Thank heavens the part I skim doesn't affect the part we get to eat! This is a great recipe, full of wonderful flavors. I did make a few changes in that I used about 4 oz of garlic feta, since that's all we had, Thai basil from the garden and added whole walnuts. I was going to add more but the dough was so chock full of the other ingredients, I didn't dare. I should have paid more attention to the quantity. I had it all shaped and into my largest brotform ..oh, gee this makes 2 loaves. All I remember reading was rolling out 2 logs, twisting and coiling into a loaf..uh..not 2 loaves. In any case..we have a very large loaf of wonderful, tasty bread. Pictures tomorrow..we have to go set up our chairs to view the fireworks across the street! Happy and Safe 4th of July TFLers ..Happy Birthday America!! 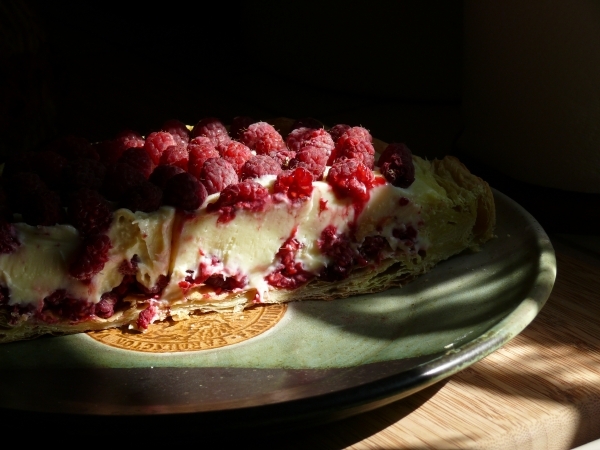 Here's a pic of what's left along with some White Chocolate Raspberry tart with raspberries from the garden (not the best pictures, sorry). Pamela, tell me how you shape this bad boy. I had a heck of a time getting a tight skin, the goodies kept popping through and would leave a tear. Hi Betty. I shaped it like a challah which seemed to keep the goodies in and provided a nice loaf. Your raspberry tart looks terrific. Hi Pamela. I will try your method of shaping next time. My husband just loves this bread. Thanks so much for sharing and thanks for the compliment on the tart. Oh, wow! I missed this beauty when I was on vacation. 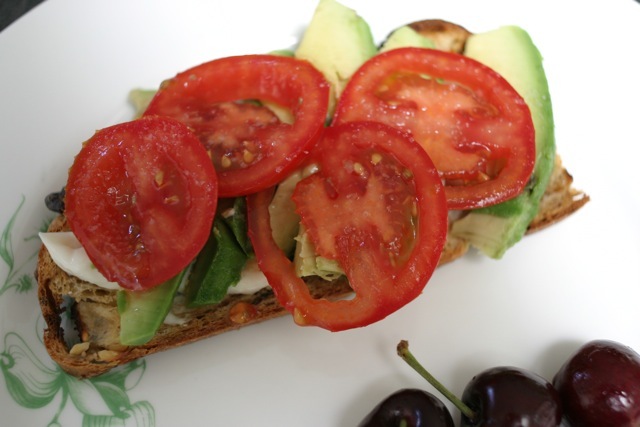 Glad it came up again---this bread looks like a picnic :-) Very nice! 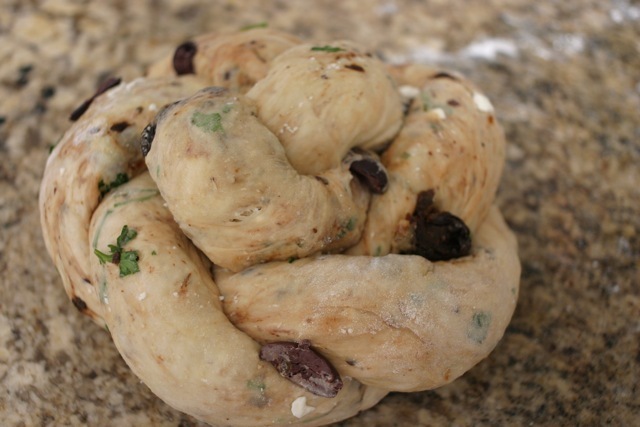 Hi Pamela - a friend requested that I try this bread - your recipe looks ideal but I have 2 questions - it create 2 loaves each recipe - so each rectangle is rolled out, with feta - then do you roll it over lengthwise to create a tube stuffed with feta? I am just confused. Hi Aprea. Roll each ball into a long rectangle (12 inches). Sprinkle each rectangle with the cheese and olives, etc. Then cut each rectangle into two lengthwise (you now have four strips, each six inches wide). Now roll up each strip from the long side (this gives you four 12-inch long tubes). Each loaf consists of two tubes braided together. I don't know how to convert it to SD. If you want to do that, I think it would be better to choose a SD loaf that you like and just fill it with the feta, etc., and shape it like above. I LOVE Betsy's book - it's like my Bread Bible - great for beginners, too, since it has a lot of detail. But, I've misplaced it in my last move, and I wanted to make this bread, literally yesterday. I, too, have a tough time with keeping the "goodies" from popping through the dough, Part of that, I think, is that I like chunkier goodies - I don't like to chop the olives or crumble the feta too fine. And FWIW, I usually make these as rolls. They make a great "meal-on-the-go" and a much-appreciated gift for friends dealing with a sick loved one, new baby, or death in the family.